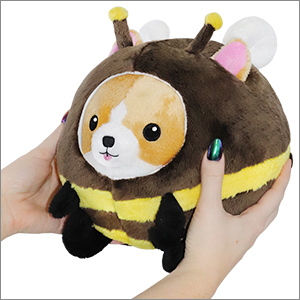 Undercover Corgi in Bee: An Adorable Fuzzy Plush to Snurfle and Squeeze! His face was smooshed into the corner of the box when I took him out, and it's still deformed after about a month of loving on him. His eyes are different distances apart from his nose and he is literally the love of my life. I ordered this for my boyfriend as a Halloween gift. He is crazy about corgis, and the bee was just too cute. When he saw it, his face lit up. He was so excited to get this! It was so soft and adorable, I almost couldn't give it up. I'm so glad I got this for him.